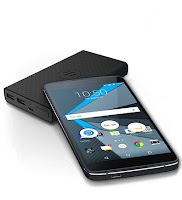 The Canadian manufacturer BlackBerry announces a new Android smartphone - DTEK50. The middle-class smartphone will reach stores in mid-August for the price of $ 299. Thanks to various modifications to hardware and software, according to the manufacturer, it is the most secure Android smartphone in the world. As template for the DTEK50, the smartphone is identical to Idol 4 of Alcatel. While the devices are identical in terms of design and features, BlackBerry wants to score with an increased device security over the Idol 4 and other Android competitors. The DTEK50 is delivered with a "hardened" Android kernel. This includes minimizing potential attack surfaces changes and adjustments in the source code of the open operating system. A combination of hardware and software should also enable a secure boot process. According to BlackBerry, no other operating system to run as the signed BlackBerry version on the DTEK50. By random design of the address space structure BlackBerry also wants to prevent attacks caused by a buffer overflow. The DTEK50 also maintain the US government security standard FIPS 140-2. This is to protect the personal information such as photos and data from unauthorized access. BlackBerry also promises continuous security updates, close the gaps discovered in the Android system. Last but not least the DTEK50 is already made by the BlackBerry Priv equipped with known app DTEK. It should warn the user when his data is at risk. In this case, a light indicates the security status of the device. The Pre-order of DTEK50 is already available in the manufacturer's online store.